Find a low-down-payment mortgage today. 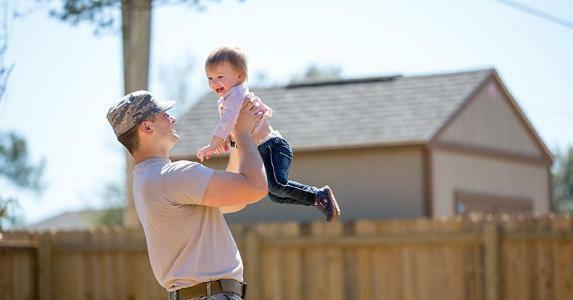 The Department of Veterans Affairs, or VA, guarantees purchase mortgages with no required down payment for qualified veterans, active-duty service members and certain members of the National Guard and Reserves. Private lenders originate VA loans, which the VA guarantees. There is no mortgage insurance. The borrower pays a funding fee, which can be rolled into the loan amount. For purchase and construction loans, the VA funding fee varies, depending on the size of the down payment, whether the borrower served or serves in the regular military or in the Reserves or National Guard, and whether it's the veteran's first VA loan or a subsequent loan. The funding fee can be as low as 1.25 percent or as high as 3.3 percent. For first-time purchasers making no down payment, the funding fee is 2.15 percent for members or veterans of the regulator military, and 2.4 percent for those who qualify through service in the Reserves or National Guard. Navy Federal Credit Union, the nation's largest in assets and membership, offers 100 percent financing to qualified members who buy primary homes. Navy Federal eligibility is restricted to members of the military, some civilian employees of the military and U.S. Department of Defense, and family members. The (Department of Agriculture, or) USDA's Rural Development mortgage guarantee program is so popular that it has been known to run out of money before the end of the fiscal year. Qualified borrowers can make down payments as low as 3 percent with private mortgage insurance, or PMI. For most borrowers, PMI costs less than Federal Housing Administration mortgage insurance. But PMI has stricter credit requirements. Find a low-down-payment loan with PMI today. With a minimum down payment of 3.5 percent, the FHA is the low-down-payment option that's available to people with imperfect credit histories. The FHA charges an upfront premium of 1.75 percent of the mortgage amount. On a 30-year loan with the minimum down payment, there's an annual premium of 0.8 percent of the mortgage amount, or $800 a year for each $100,000 borrowed -- $66.67 a month for a $100,000 loan.